The White Horse has always had a reputation of being haunted. The oldest part of the building is early 16th century, and was almost certainly a coaching inn on the road between Winchester and the West Country. The stables have long gone, but can be seen in early photographs. The building is home to three large inglenook fireplaces, two on the ground floor and one on the first floor, but it is the oldest one in the public bar that attracts the most interest. The cast iron fireback which throws enormous heat into the bar is decorated with the crest of Charles the first, and the two brick built seats on either side of the fire must have been very sought after on the cold winter nights. As you sit on the right hand chair and look up the chimney it is possible to make out hooks for hanging bacon sides for smoking, but even more unusual is a large recess in the side of the chimney. It is easily big enough for one or two people to crouch in and with the fire roaring below it is not hard to imagine that it might have been a priest hole to hide Catholics during the period from the mid 1500’s onwards. As for the haunting, well things have flown off the shelves by themselves, and people on their own in the pub at night have felt a “presence” but it might just be the beer! The White Horse is situated on a slight bend in the main road that runs between Romsey and Winchester. It benefits from having a large garden that overlooks the downs and meadows of Hampshire and is next to both the village cricket ground, the recreation area and an 18 hole par 3 golf course. Parts of the ancient building of the White Horse date back to the 16th century, and the two large Inglenook open fires bear testament to their heritage with their smoking chambers and their priest hole. 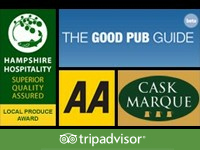 The White Horse has received a number of awards and quality marques. We are proud of these and they are your assurance that will give you an excellent service whether you are dining in celebration or just popping in for a quick drink. Winners of the Certificate of Excellence award.